Despite the rain, the designer Javier Alcantara received the deserved “Alfiler de Oro Pasarela Larios Málaga Fashion Week 2018”, from the hand of the Deputy Mayor and Councilor, Elisa Pérez de Siles and Pepe Cobo, founding partner of El pimpi. On the same day, the event was opened by the Tenerife designer, Juan Carlos Armas, with the participation of Dunnes Stores with the signatures Savida and Gallery; and the designs of Lucas Balboa, Hind Iraqi Caftan, Banana Moon, Ewaiso, Mario Teo, Impeccable Modas, Sixteen One, Mann and closure by Ágatha Ruiz de la Prada. 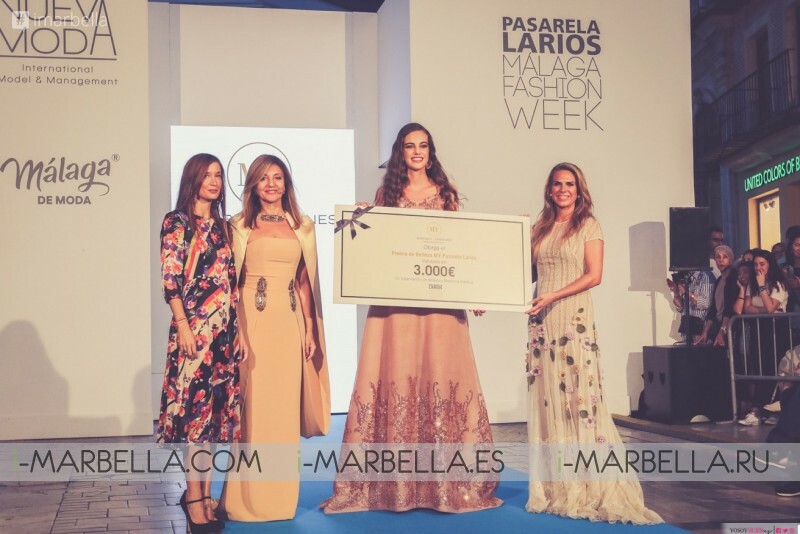 In addition, the model Carmen Celli, has been the winner of the Beauty MY Award from the hand of the director of the Institute of Beauty and Aesthetic Medicine, Myriam Yébenes and Elisa Pérez de Siles. An award that recognizes the qualities of the models to the parade. Also receiving a prize of 3,000 euros in treatments at its boutique center in Malaga. Check out the first part of the Pasarela Larios Malaga Fashion Week!